← Gujarat Solar Projects – Comparison of Energy Generation Data for March 2012 Vs May 2012 :: Facing the 1st scorching Summer of Gujarat, India !!!! It’s been very late arrival of Monsoon in most of the parts of Gujarat by now. Also since past two days there has been news of continual power failure in the Northern Grid of India affecting almost entire 13 states of India, more than the entire population of the EU. The combined northern and eastern grids serves and affects about the life of approximately 600 million people. The power failure on both the days has raised serious concerns about India’s outdated infrastructure and the government’s inability to meet the country’s energy needs as it vies to become a regional economic superpower. Also on 30th there was a good debate on this topic on one of the news channel with panel members including Dr R K Pachauri, Director General, TERI who specifically emphasized on increasing the efficiency of the power plants of India, reducing T&D losses and to rely more and more on the Renewable Energy Sources in order to maintain the overall progress that India has targeted. India’s demand for electricity has soared along with its economy in recent years, but utilities have been unable to meet the growing needs. India’s Central Electricity Authority reported power deficits of more than 8% in recent months. Still One-third of India’s households do not have enough electricity to power a light bulb, according to last year’s census. 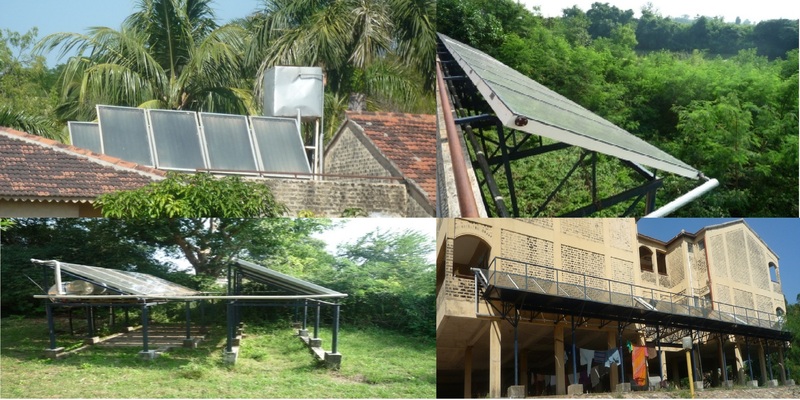 Development of the first solar steam cooking system in India. Installed the world’s first & largest solar powered air-conditioning system (100 ton system) for the Kailash Cancer Hospital (MSA), in Goraj India using Scheffler Concentrators. At present he mentors and supports many start-ups like Excellent Renewable Pvt Ltd > a Biogas company and GreenForce Enviro Pvt. ltd a company in Mumbai that offers Green Solutions. He is also Chairman of Gehrlicher Solar India Pvt. Ltd. a JV between Gehrlicher Solar AG of Germany and GreenForce and offers EPC Solutions for MW Solar Parks. He also guides and mentors “The Green India Initiative (TGII)” and gives honorary service as a Trustee at Muni Seva Ashram at Goraj. In the last two decades Muni Seva Ashram has increased its scope of activities by many folds, credit for this exemplary growth goes to Pujya Anuben, for her love for humanity and to Dr. Vikrambhai who integrated education, health care, alternative energy, social services and agriculture to create an Ashram that Mahatma Gandhi would have been truly proud of. He wouldn’t have hesitated to move from Sabarmati ashram to the Muni Seva Ashram!. Banter apart; the Ashram is an amazing place and the below description of all the renewable technologies deployed will provide only glimpses of what it is really like. There is no equal to visiting the Ashram. I highly recommend all the readers to visit MSA at least once in life time. Back when the ashram was established in 1980, there was an utter lack of basic infrastructure such as drinking water, sanitation, roads and power. In such situation, alternative energy was not an option, it was a necessity. Thus began the journey to change the status quo by judicious use of appropriate technology and to manage to live in harmony with nature. The ashram has experimented and successfully implemented a vast assortment of Sustainable solutions and Renewable Energy technologies to meet its needs. The Ashram today relies majorly on the Renewable Energy Technologies to meet its power requirement for High school, Air Conditioning requirement for the state of art cancer hospital and for preparing meals using the renewable energy systems deployed in the ashram premises. When Ashram started the residential schools in the 90s, there was no electricity and the students struggled to do their homework. The ashram met the challenge by installing a solar power plant. This photo voltaic solar plant generates 13 KW peak power and provides electricity and lighting to the 400 residential students. To cook for its 1200 strong community the Ashram kitchens needed a vast quantity of firewood. The ashram met this challenge by a combination of bio-gas plants and solar dishes for cooking. A thermic fluid based solar cooking system provides adequate temperature to fry, bake or roast in the comfort of kitchen. There are 10 dishes used for solar cooking system. The unique experimental feature of this system is that it uses thermic fluid instead of steam. Thermic fluid provides higher temperature of 200 degc required for frying. Another advantage is that it retains heat for a longer time than water, thus allowing it to be used for night time cooking. The ashram runs a state-of-the-art Cancer hospital. It needs constant air conditioning because of the medical equipment it operates. Ashram has installed a Lithium Bromide based Vapour Absorption Chiller (VAC) refrigeration system that can achieve cooling up to 6 degc. Necessary heat was provided by two bio-boilers of 1.5 ton and 3 ton capacity. The machine required 5000 kg of wood per day. To reduce wood consumption, Ashram has installed a solar steam generating system which employs 100 parabolic dishes for concentrating sun’s heat. This allows water to reach a temperature of 180 degc and converts water to steam at 8 to 10 kg/ cm2 pressure. The temperature at the receivers reaches 500o C. For backup purpose, a wood fired boiler is used. This solar steam generating system which generates enough steam to run a 100 TR of air conditioning is world’s first and largest commercially executed Solar Air Conditioning System using Scheffler Concentrators. India’s largest Solar air-conditioning plant. (100 TR) using Scheffler Concentrators. Ashram also has a wood gacifier which burns wood in scarce air and produces carbon monoxide and hydrogen, which is used as fuel in an internal combustion engine to produce electricity for utility. Ashram has 650 acres of land at Bakrol farm where there is a large Gaushala with more than 300 cows. The cow-dung is used as fuel for a large scale bio-gas plant. There are three digesters two of 85 cubic metre capacity (floating dome model KVIC) and one 250 cubic metre (fixed dome model). The floating dome digesters are fed with cow dung only and the fixed dome digester is fed with any type of biodegradable waste including kitchen waste. The biogas is scrubbed of CO2, compressed and stored in bottles which are used as fuel in the Atithi Mandir kitchen and also as fuel for a mini truck used by the ashram which runs for 180 km on two bottles (9 kg at 180kg/cm2 pressure each). The slurry which is vermi-composted and used as organic fertilizer in ashram farms. 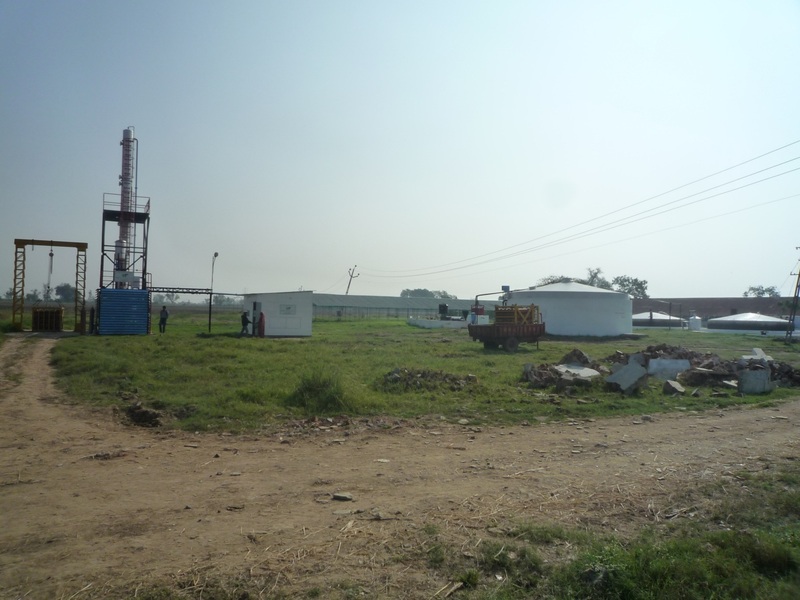 This Bio gas plant provides 1000 meals each day. The gas is clened, compressed, bottled and brought to the Atithi canteen in a transport rack. Earlier when the biogas wasn’t available, LPG was used. The kitchen required 2 bottles each day. Biogas has reduced dependence on fossil fuel. One of the very unique feature of the Ashram is the installation of World’s First and only “Solar Crematorium”. Cremation is the normal practice across India. When a person dies, 200-300 Kg of wood is required to cremate the body. 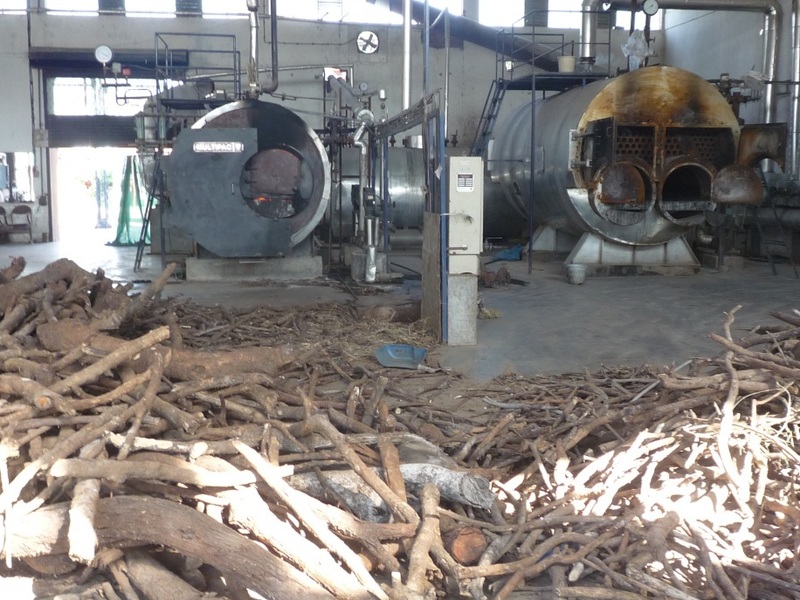 Recognizing the need to conserve the wood, ashram installed a 50 Sq meter dish to burn dead bodies. When operational, the system will use biogas as backup and will burn a body in 100 minutes. Besides all of this unique technologies the ashram has also has 76 home lighting systems each lighting 3 CFL. Each panel converts solar radiation to electrical energy which is stored in batteries for later use. Solar Water heater at various ashram buildings are installed of about 8000+ liters capacity in total along with Solar-LED based street lighting’s. Friends, it was a pleasure visiting the Green Ashram and knowing about all the various Renewable Energy Technologies deployed at ashram at one place. Unique !!!! Isn’t it ????? Wait….There is more to come…..Future Plan : “The ashram has planned to setup a 1.2 MW biogas plant which will provide 100% of the energy needs of the ashram. It will provide required gas for cooking, compressed gas for operating farm vehicles, electricity for the hospitals and fertilizers for the farms. The waste heat from gas engine will be used for running its vapour absorption chiller for air-conditioning. The ashram is expected to become grid-free in 2012. Ashram also proposes to provide surplus gas to nearby villages for power and gas.” !!!!! MSA truly is India’s one of its kind of Green Ashram serving people for their betterment & showcasing a Eco-Friendly Energy model that now needs to be deployed universally for humanity to exists…. All of this shows that Renewable Energy Technologies are affordable, scalable and can be deployed even at the grassroots level to meet all the basic energy requirement of human race & also looking at the present energy crises/deficit and increasing Global Climate Change through excessive dependence on conventional sources of energy makes Renewable Energy not a matter of choice now !!!! It’s a Compulsion ! Meanwhile for all the Solar Enthusiasts as I mentioned in my previous blog we are going to publish Asia’s first Solar PV technology benchmarking report of 700+ MW co-located utility power generation project installed at kutchh, surendranagar, patan and other parts of Gujarat including asia’s first solar park at charanka in the state of Gujarat. This Report will display very vital information required for benchmarking like generation data of last three months, rating & capacity, manufacturer & make of the product used in installation of Solar PV project..
Till then….”Think & Grow Rich Green” ! This entry was posted in www.urvishdave.com and tagged Biogas, Biogas Plant, Green Ashram, Gujarat Solar Project, Largest Solar Air Conditioner, Muni Seva Ashram Goraj, Scheffler Solar Technology, Shri Deepak Gadhia, Solar AC, Solar AC Gujarat, solar ac in India, Solar Crematorium, Solar Crematorium Gujarat, Solar India, Solar power ac, Solar PV India, Solar Thermal India, Solar Village of India, urvish dave website, World's First Solar Crematorium, www.urvishdave.com. Bookmark the permalink. Very informative article. Great work! Is the solar crematorium functional?